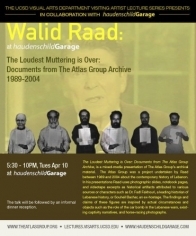 On April 10, 2007, the haudenschildGarage collaborated with the Visual Arts Department of UCSD to present a Garage Talk with Walid Raad on his project The Atlas Group. The Loudest Muttering is Over: Documents from The Atlas Group Archive was a mixed-media presentation of The Atlas Group's archival material. The Atlas Group was a project undertaken by Raad between 1989 and 2004 about the contemporary history of Lebanon. In his presentations Raad used photographic slides, notebook pages, and videotape excerpts as historical artifacts attributed to various sources or characters such as Dr. Fadl Fakhouri, a leading historian of Lebanese history, or Souheil Bachar, an ex-hostage. The findings and claims of these figures were inspired by actual circumstances and objects such as the role of the car bomb in the Lebanese wars, existing captivity narratives, and horse-racing photographs.